Janine Marsh, the editor of www.thegoodlifefrance.com and a member of the British Guild of Travel Writers, tells us why a day trip to Carcassonne is a must. The Languedoc region is often called the real south of France. It covers a wide area and has many personalities – more vineyards than anywhere in the world, rugged mountains, huge lakes, spectacular gorges and elegant cities. It is a region with a fascinating heritage and the ancient walled city of Carcassonne is one of the most impressive jewels in its crown. Perched high on a rocky hill top, Carcassonne has its origins in the Gallo-Roman era dating back to the 1st century BC; thanks to its strategic location it has been the target of many invaders and has a colourful past. Today the fabulously restored hill-top castle and beautiful medieval town ensure it is one of the most visited places in southern France. Carcassonne makes for a perfect day trip for Canvas Holidays guests at Les Méditerranées – Beach Garden, Marseillan-Plage. If you want a break from soaking up the sun on the beach or by the pool, Carcassonne, just an hour away by car, is a must-see with its rich cultural history and dramatic beauty. Structured in two distinct sections, Carcassonne is renowned for its La Cité, a UNESCO World Heritage site surrounded by 3km of walls and 52 towers. Film buffs might recognise the medieval citadel from Robin Hood: Prince of Thieves. Some of the 1991 movie was shot there. The Ville Basse (lower town) created in the 13th century, spills out below, along boulevards that mark the ancient city walls. The two halves of the city are joined by the Pont Vieux, which crosses the River Aude. 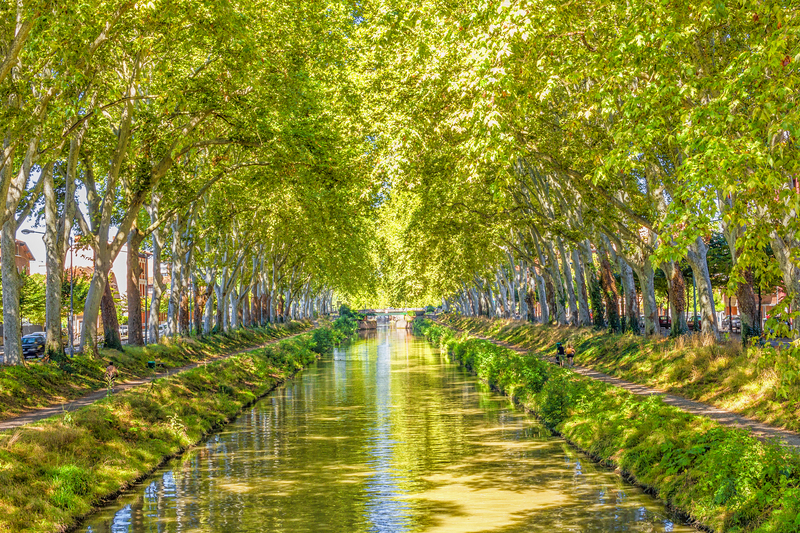 The Canal du Midi, the town’s second UNESCO World Heritage site, passes through Carcassonne, and makes for a perfect boat trip or picnic on the leafy banks. Enter the ancient inner Citadel via cobbled ramps to discover tiny streets crammed with history. Allow an hour to see the citadel’s 12th century château built on Roman foundations. Jousting displays – which sound touristy but are actually quite impressive – are held twice a day in July and August at the foot of the ramparts. If you’re travelling with young children, you can also take the little train and enjoy a 20 minute, multi-language sightseeing tour of the spiky turrets and remarkable ramparts. You can easily spend hours in the museums and quirky shops of Ville Basse, which are not as tourist-oriented as the shops in La Cité. Visit the Chapelle des Dominicaines (Rue du Verdun) to view a great timeline of the city’s history running round its walls. If a day of sightseeing helps you to work up an appetite, you’d be well advised to try a cassoulet, the region’s speciality. You can sample from numerous restaurants and cafés in Carcassonne but the Ville Basse has the best choice; take a break at the Bistro Florian in Place Carnot, the perfect spot to soak up the atmosphere. There’s no excuse to return to your campsite at the end of your day with an empty stomach! When to go From mid June to early August, the famous Festival of Carcassonne presents a series of cultural activities including concerts, theatre and dance. 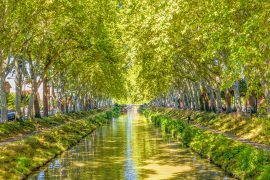 Local’s tip Take a boat trip along the Canal du Midi. You can take a guided tour or hire your own boat (the ticket office is opposite the train station). Dining out If you only eat in one place it should be Les Trois Couronnes for great food and prices, a good children’s menu and amazing views thanks to the restaurant’s fourth floor vantage point. Photo opportunity The whole town is a photo opportunity but if you have a head for heights, climb the tower of the beautiful St-Nazaire church in the citadel (rue St-Louis) – there are spectacular views over the Cité.